The German invasion of the Soviet Union in 1941 is the wargamer’s Mount Everest. The fate of the USSR was on the line in a way it never was before or after. The Germans had the forces and logistical support to take the all three major capitals, Leningrad / St. Petersburg, Moscow, and Kiev. They had an adversary that was numerically and, in many ways, technologically superior. But the Soviets were also disastrously led and unprepared for modern war. As operational puzzles, Operation Barbarossa and the ensuing battles are irresistible. It’s no surprise, then, that I’ve spent the last week consumed with the final expansion to 2×2 Games’ Eastern Front entry-level wargaming masterpiece, Unity of Command: Black Turn. It’s also no surprise that I find myself reliving the autumn of 1941 again and again, trying to find the solutions that eluded Hitler’s generals and which continue to elude me. This is an expansion that demands near-perfection even as it attains it. Here’s what makes the invasion of Russia such a good subject for a solitaire wargame: it’s a battle where only the attacker really has significant options. Like in a chess problem, one side consistently has the initiative, and the challenge is in finding the maneuvers which necessarily drive the opposition into checkmate. The Germans have three major problems to overcome. The first is the Soviet Army, which is more of an obstacle than an adversary. Their armies are employed as physical barriers to German progress, but they cannot maneuver significantly. Until the gates of Moscow, the Soviets’ role is simply to buy time for more troops to reach the front and defense positions prepared around the city. The second is the Soviet landscape. The ground between eastern Poland and the major Soviet capitals of St. Petersburg, Moscow, and Kiev is divided by dense forests, huge marshlands, large urban areas, and a multitude of major rivers. All of these serve as checks on German progress even when undefended. If the Soviets get dug-in, God help the Wehrmacht. Finally, there is the simple math of distance over time. By autumn, the Soviet countryside is flooded by rains and slows the blitzkrieg to a crawl. By winter, the Germans are finished. With every day, more Soviet formations reach the front and their capacity to resist increases. Everything the Germans do, they must do at a pace almost unheard of elsewhere in military history. The best treatment of these themes might be Gary Grigsby’s War in the East, but it is also an attempt to bring almost simulation-fidelity to the topic. It teaches its lessons over a time frame that rivals the length of the actual war (my operation Barbarossa in War in the East ended up moving along in almost real-time). Unity of Command, however, remains the premier wargame for authentic abstraction. In the space of a twelve-turn, thirty or forty-minute battle, you come to grips with all the salient features of the war. Black Turn continues this tradition, and perhaps even elaborates on it. Unity of Command is the rare turn-based wargame that anyone can learn and play in a few minutes, and it’s also a reminder of why this genre used to be such a major one on the PC. There’s no complicated supply model or chain of command rules. It’s just a map where you push tanks and infantry around. Black Turn unfolds as a series of discrete scenarios as opposed to War in the East’s sprawling tapestry of eastern Germany and the Soviet Union, with the effect that it neatly captures the essential problems for each individual spearhead of the expanding blitzkrieg. In the earliest scenarios, the Germans have everything they need to win and probably a bit more. It’s really only the blinding pace that keeps things tense, as German units attempt to destroy their Soviet counterparts before they can escape encirclements or take new defensive positions across the most important routes of march. As simple as it is, Unity of Command’s rules and scenario design demand ruthless decisions and insightful planning to overcome. The math for calculating battle outcomes is so simple you can practically do it in your head, but taking and holding every military objective on-time feels like a final exam at the War College. The one key is ensuring that your units can trace a route back to friendly supply lines; units without supplies get slaughtered. But big wins require big, risky maneuvers. The trick is knowing when and where to place your bets. But a few scenarios into the game, and you start hearing the creaks and groans of an overtaxed Nazi war machine. In between phases of the main German thrusts toward Moscow and Kiev, you start spending time with an increasingly cobbled together drive toward Leningrad, or the ever-expanding front of Army Group South. 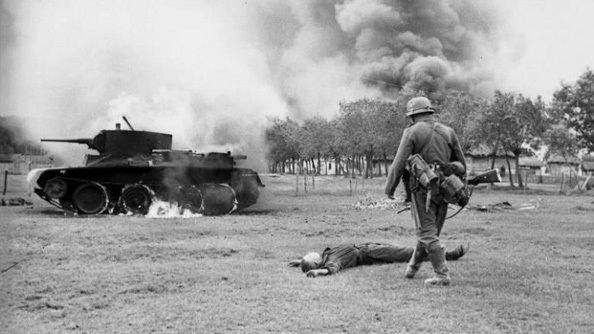 If the first scenarios are an embarrassment of wargamer’s riches, with panzers aplenty and a bottomless supply of infantry to hold the line, the later scenarios increasingly become about trying to make something out of nothing. How do you beat the Soviets with hapless infantry units on reluctant loan from Germany’s allies? 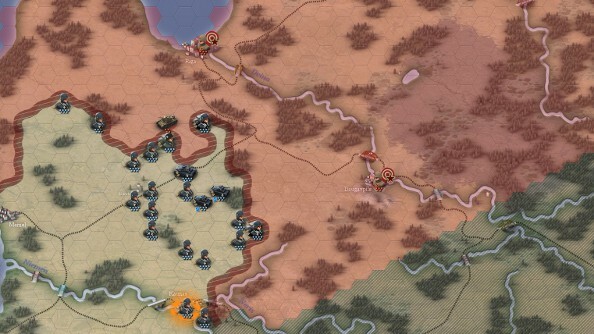 How do you advance when all your supplies flow along a single road that the Soviets can block at will? Unity of Command: Red Turn, which came out last year, fell into these traps in the early stages. 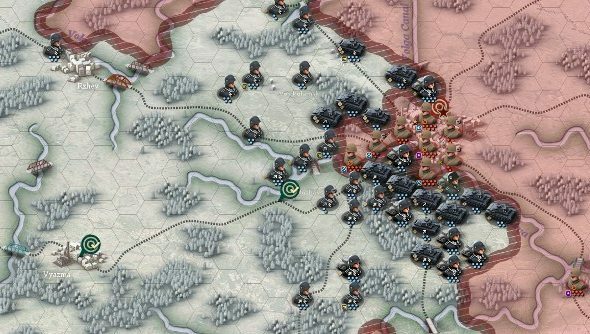 Paradoxically, that game was front-loaded with tough scenarios as the Soviets attempted to get an offensive war rolling against a still-superior German foe. The odds were so long against achieving the required results that it did seem like designer Pieter de Jong was punishing players for any deviation from some hidden ideal. Later scenarios, when the Soviets are not quite so disfavored, are a bit easier, but for many Red Turn was a huge turn-off compared to the original campaign. Black Turn strikes a happier balance. There is a wider sweet-spot between overwhelming victory, with all objectives achieved on time, and the sour taste of a near-victory. While the ideal solution might be almost impossible to find, there are many possible solutions to most scenarios, and the result is a wargame that allows the player the joy of finding many different approaches to the same problem, and refining them again and again. 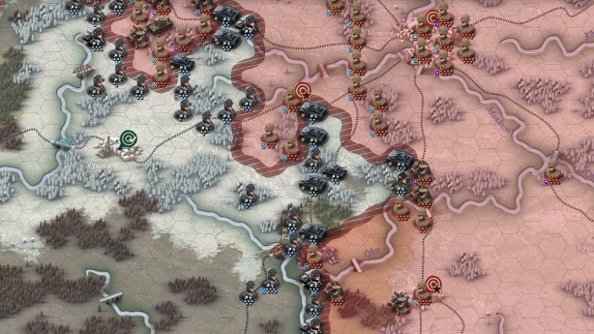 The one time I got well and truly stuck, the Taifun scenario in which the Germans attempt to seize Moscow before winter shuts them down, I always came back with a bunch of new ideas to try after each defeat. Although, to this day, I have no idea how to win a good victory at Vyazma to open the door to Moscow. It helps that the dilemmas themselves are different from the ones you find in the previous two instalments. The first game was entirely about supply lines: maintaining and expanding yours, and cutting the other guys’. The second was about attrition, knowing where to grind away at the enemy until he completely fell apart. This one is really a mix of both, with the addition of more challenging and varied terrain than the vast plains of southern Russia and Ukraine. It is the final exam of Unity of Command, and a perfect capstone to one of the finest entry-level PC wargames since Panzer General 2. Unity of Command: Black Turn is $8.99 buying direct and $9.99 via Steam.